Chicago, IL – March 26, 2019 – Globus, the leading research data management service, today announced the lineup of speakers for its eighth annual user conference, GlobusWorld 2019, held this year on May 1-2, 2019 in Chicago, IL. The program includes guest keynote addresses by Tom Barton, Senior Consultant for Cybersecurity and Data Privacy at The University of Chicago and Internet2; and Bobby Kasthuri, Neuroscience Researcher at Argonne National Laboratory and Assistant Professor in Neurobiology at The University of Chicago. 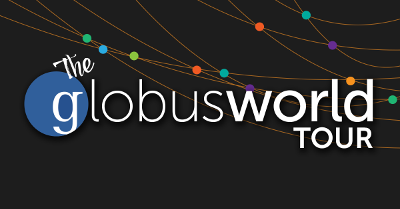 Columbia University is hosting a day-long GlobusWorld Tour of workshops on Wednesday, April 24. Get details or register here. Used by researchers and students from all fields of science, XSEDE coordinates access to the National Science Foundation’s public supercomputing systems, such as Texas Advanced Computing Center’s Stampede2 and Pittsburgh Supercomputing Center’s Bridges. XSEDE uses Globus Auth as its Web Single Sign-On (SSO) service, allowing XSEDE web applications to sign users on and access their XSEDE identities.